Content: Some fighting and death. There is one word to describe how I feel, DISAPPOINTED. I have read the four novellas in this series and loved the first three. The fourth was a bit of a disappointment as well because they killed off my fav character. 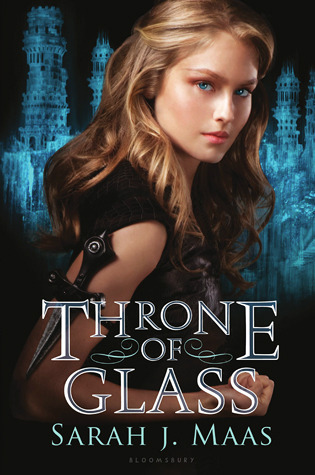 I tried to get over that fact and waited a while before reading Throne of Glass. I thought for sure that this book would make up for the previous disappointment. It did not. Really it is a good book, interesting premise, mysterious characters, really there was nothing glaringly wrong with it. 1. There was a lot of action. 2. The secondary characters were interesting. 3. Celaena's back story was explored. 4. Celaena gets the chance to redeem herself. 5. There was a mystery. 1. The love interests (I think it was a love triangle, but it seemed that maybe the captain just wanted a friend) were boring. Dorian really just annoyed me and Chaol was boring and did what he was supposed to do. I mean where the disobedience, come on!! 2. Celaena got even vainer. I mean I am totally fine with the heroine being pretty. I really do get sick of all the nerdy weird girls getting the spotlight (even though I am nerdy and weird) but still all she can focus on is her appearance. Her constant thought always involved clothes and hair and whether everyone else will think she's gorgeous. 3. The mystery was obvious. From the first death it was like, come on Celaena, get with the program it's obvious! Although at one point I did get a little suspicious of another character, but a couple pages later, I knew I was wrong. So the mystery part wasn't so good. 4. Celaena's back story was interesting, why wasn't there more details! Now that I think about it, they will probably be in the next book. 5. There were a couple of other things that made me mad, but they were minor. I missed Sam and was not able to even remotely like the new guys, even though I did feel bad for Dorian at the end. I think that my main problem is that I still am mad about Sam's death and how now Celaena has moved on. Although I do get it, to her it's been a year, but to me it's been a few weeks. I think that this book is worth giving a shot, but I warn you it doesn’t really live up to the hype. Sorry if I vented a lot in this review, but there were certain things I needed to address. WOULD I READ THIS BOOK: YEP, worth the time. WOULD I RECOMMEND THIS BOOK: Yes, though I might say to read this first, then go back and read the novellas, so you don't feel the lose for Sam and the hate for the new characters so strongly.